Many of us are familiar with the typical shabu-shabu scenario where diners dig into a steaming pot of soup, meat, and vegtables. Now, take it a step further and toss a plate of Ramyun noodles into the pot. The soft noodles cut through the heady spice of the broth and when you're met with the third step, a rice porridge called juk, your dining experience is brought to a level of comfort and familiarity. The juk is a combination of the shabu-shabu brothe and Korean rice, and topped with eggm saldy seaweed, and crisp vegtables for a flurry of flavors and textures that cap off a truly filling meal. 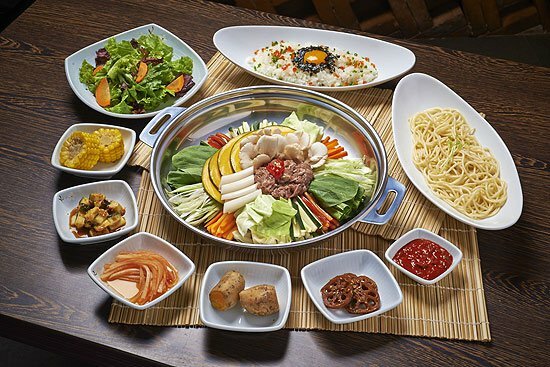 This is Bulgogi Brothers' latest offering: a Korean-style Shabu-Shabu. More than a collision of two different worlds, it's a marriage of familiar Korean flavors and the time-honored tradition of mixing ingredients in bubbling broth. It is said that the name shabu-shabu was coined after the sound that is heard what meat is "swished" in boiling water, an activity whose charm never lost on diners. They hope its popularity trascends to even Korean food fans. Chef Josh Boutwood emphasizes Bulgogi Brothers' authenticity, from ingredients shipped straight from Korean to a ritual that is faithful to shabu-shabu's concept of gathering around a large pot of steaming soup with family and friends. Cooking is an experience best shared with loved ones, and the end results do not disappoint. Choose between three different shabu-shabu selections, good for three or four people. The Ham and Sausage (P795) is an East-meets-West pot of ham, sausage., cabbage, mushroom, and bean sprouts. For diners lookung for the extra smack of spice, try it with gochujang or Korean hot chili paste. Meanwhile, the Beef and Veggies (P695) is made up of thin slices of beef bulgori on a garden of fresh leeks, peppers, cabbage, bean sprouts, and mushrooms. Their bestseller is the Mixed Seafood (P995), a generous plate of mussels, squid, plump clams, and blue crab heaped on a spicy broth. While you're at it, check out the other new items on the menu, including the standout King Galbi Tang (P595), a large bowl of beef chunks that are so soft and tender they fall off the bone, swimming in a clear brothe of slippery glass noodles. The Beef Belly BBQ (P495) is also noteworthy; sprinkle just a dash of salt and it bursts with surprising flavor when you sink your teeth into lettuce wrapped around it. More than just flavors, Chef Boutwood also highlights presentation. It's about bright colors in every dish, he says, and he's right. Feast your eyes on a colorful plate, but not for too long. Digging in is the best part.